I never knew that abdominal migraines even existed until a friend told me she was diagnosed with them. This intrigued me because I wondered if it was due to Gastroparesis or if it just made Gastroparesis worse? 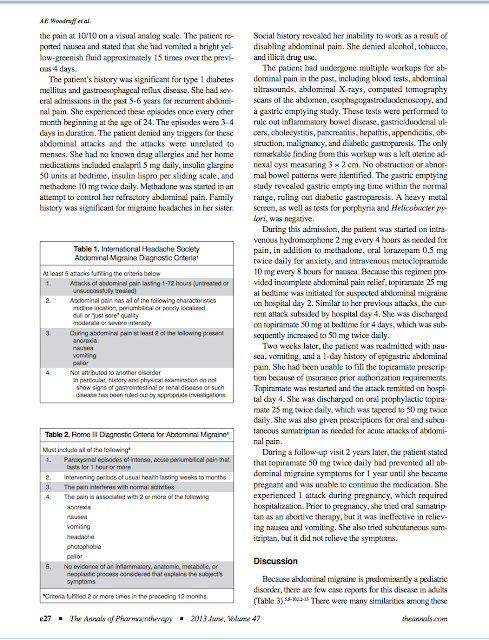 Since June is Migraine Awareness Month, I wanted to do some research on abdominal migraines and go from there, in order to understand it better, and to see if there is a connection between them and Gastroparesis. As with any form of migraine, there is no diagnostic test to confirm abdominal migraine. Diagnosis is achieved by reviewing family and patient medical history, physical examination and performing investigations to rule out other causes of the symptoms. Examples of other conditions that should be ruled out to arrive at a diagnosis of abdominal migraine include: urogenital disorders, kidney disorders, peptic ulcer, cholecystitis (gall bladder), bowel obstruction, gastroesophageal reflux, Crohn’s disease, and irritable bowel syndrome. If there is any alteration in consciousness, seizure disorders should also be ruled out. 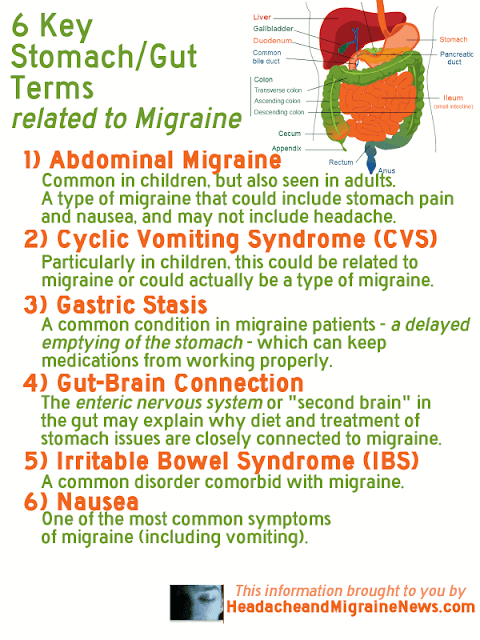 Abdominal migraine is a sub-type of migraine seen mainly in children. It consists of episodes of abdominal pain with nausea, vomiting, loss of appetite or pallor. Between episodes, there should be no symptoms. 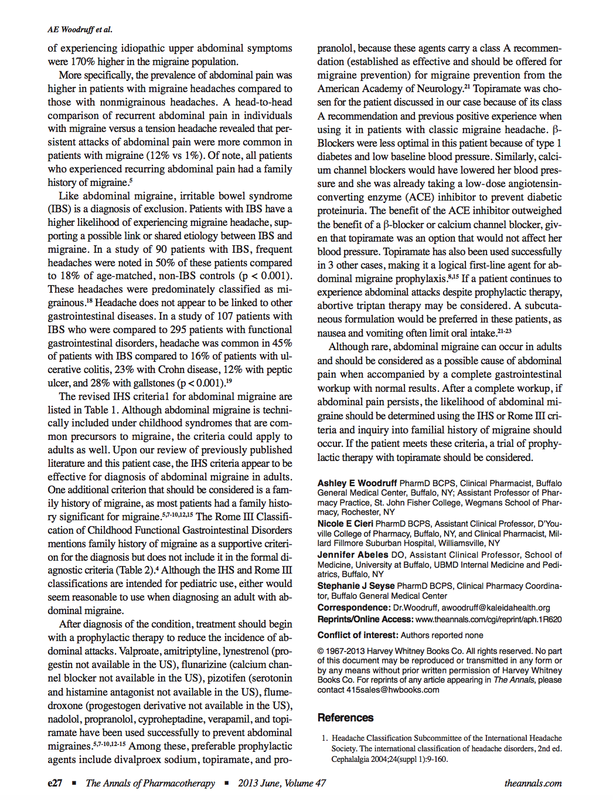 Children with abdominal migraine generally go on to develop migraine headaches later in life. 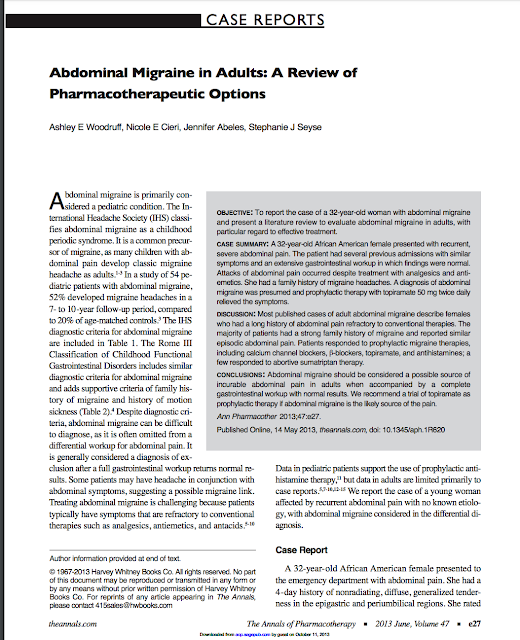 People suspected of having abdominal migraine should be carefully assessed by their doctor for an underlying cause as certain gastrointestinal, urogenital or metabolic conditions may mimic abdominal migraine. Gelfand AA. Episodic syndromes that may be associated with migraine: A.K.A. “the childhood periodic syndromes”. Headache. 2015;55(10):1358-1364. Evans RW, Whyte C. Cyclic vomiting syndrome and abdominal migraine in adults and children. Headache. 2013;53(6):984-993." "What is an abdominal migraine? An abdominal migraine is a type of migraine that affects mostly children. Unlike migraine headaches, the pain is in the belly — not the head. Abdominal migraines often affect kids between ages 7 and 10, but sometimes adults can get them too. This type of migraine is uncommon, affecting between 1 percent and 4 percent of children. An abdominal migraine can easily be confused with other, more common causes of stomachaches in children, such as irritable bowel syndrome (IBS) and Crohn’s disease. 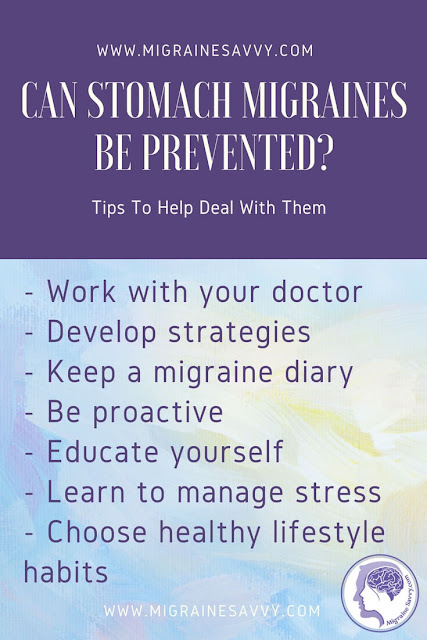 The main symptom of an abdominal migraine is pain around the belly button that feels dull or achy. 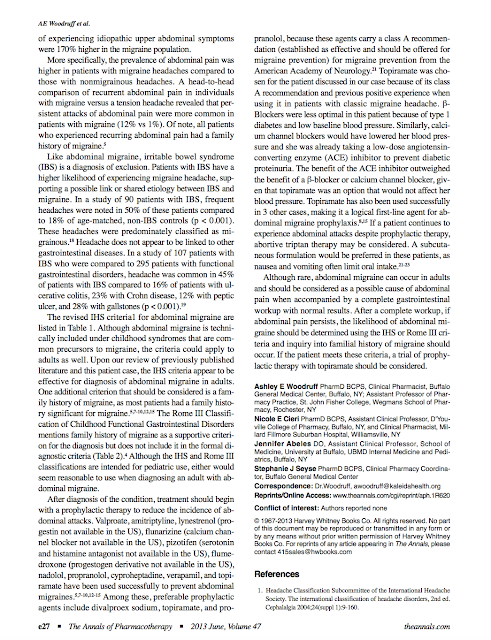 The intensity of the pain can range from moderate to severe. Each migraine attack lasts between one hour and three days. In between attacks, kids are healthy and have no symptoms. The symptoms of an abdominal migraine are similar to those of many other childhood gastrointestinal (GI) conditions — that is, those involving the digestive system. 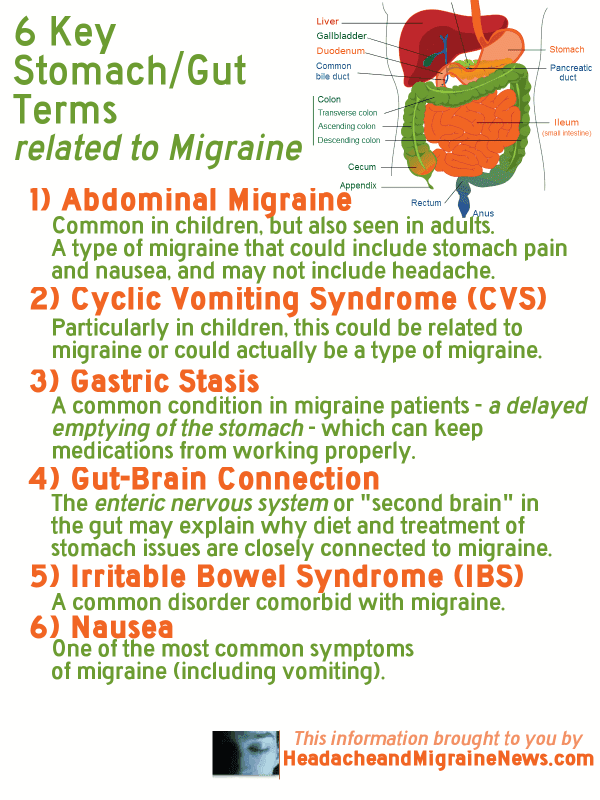 The difference is that abdominal migraine symptoms come and go with days to months of no symptoms. Also, each episode of abdominal pain is very similar. Doctors don’t know exactly what causes abdominal migraines. It could share some of the same risk factors as migraine headaches. One of the theories is that abdominal migraines stem from a problem in the connection between the brain and GI tract. One very small study also found a link between this condition and slower movement of digested food through the intestines. Abdominal migraines are more common in children who have close relatives with migraine headaches. One study found that more than 90 percent of kids with this condition had a parent or sibling with migraines. More girls than boys get abdominal migraines. Certain factors seem to trigger abdominal migraines, including stress and excitement. Emotional changes might lead to the release of chemicals that set off migraine symptoms. 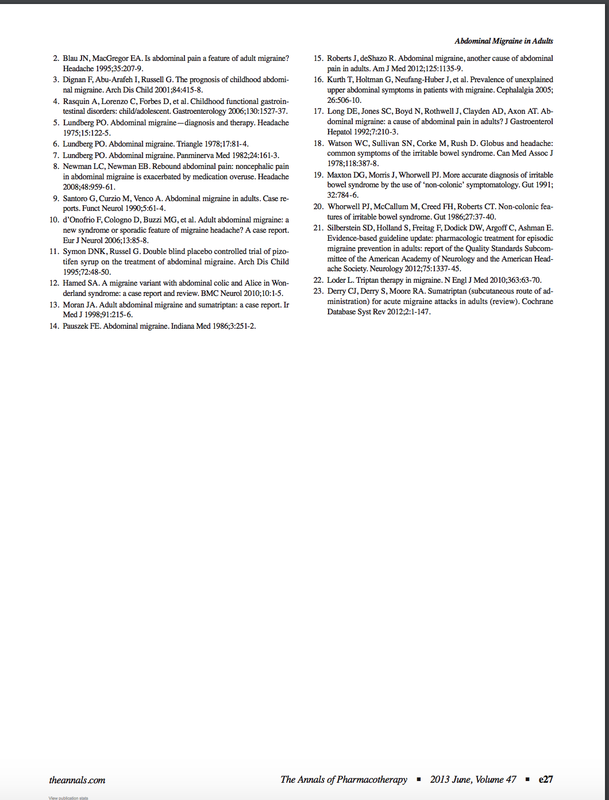 triptan migraine drugs, such as sumatriptan (Imitrex) and zolmitriptan (Maxalt), which are the only triptan drugs approved by the U.S. Food and Drug Administration (FDA) for children over 6 years old. Other medicines used to prevent migraines may prevent abdominal migraines if your child takes them every day. Be sure your child is getting enough sleep, eating regular meals throughout the day, and drinking plenty of fluids (without caffeine). If your child is vomiting, give them extra fluids to prevent dehydration. Certain foods — such as chocolate and processed foods — may set off abdominal migraines. Keep a diary of your child’s diet and migraine attacks to help you identify their trigger foods and avoid them in the future. Cognitive behavioral therapy (CBT) can help relieve stress, which is thought to be another cause of abdominal migraines. Doctors don’t have a test specifically for abdominal migraines. Your doctor will start by asking about your child’s medical history and your family’s medical history. Children with abdominal migraines often have family members who get migraines. The doctor will also perform a physical exam. Kids usually grow out of abdominal migraines within a year or two. 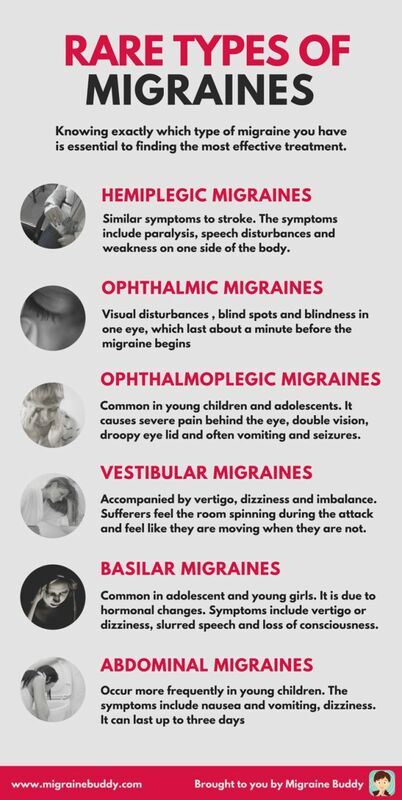 However, up to 70 percent of these children will go on to develop migraine headaches when they grow up. Some will also experience abdominal pain in adulthood." 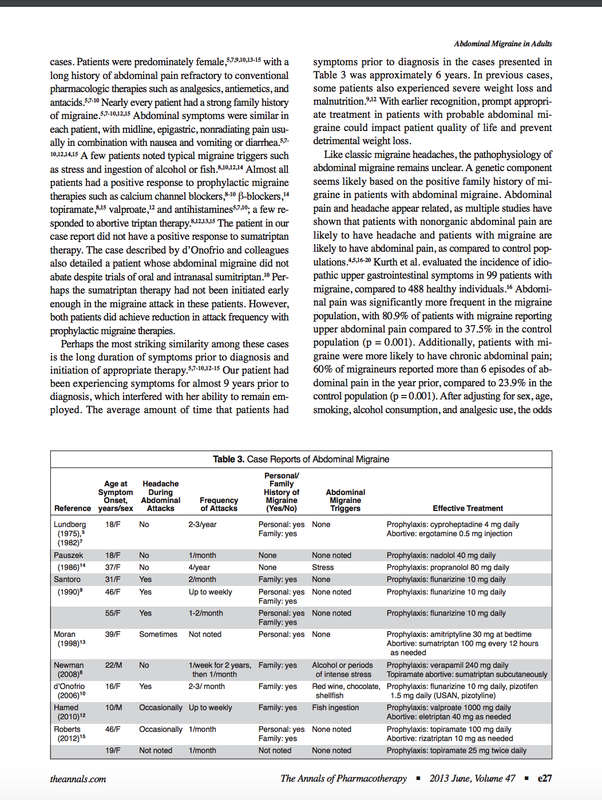 I just wonder if there is a correlation between a damaged vagus nerve and abdominal migraines? 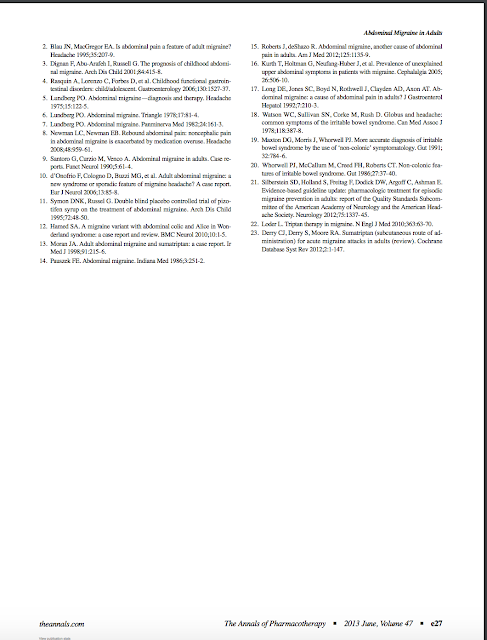 I have not found anything in my research that supports that except for what the vagus nerve controls. I will try to keep this article updated and try and find the answers to questions that I have about this condition. Above is a chart of Abdominal Migraines but I also included another chart with different kinds of Migraines I have never heard of before. I hope this will help someone out there, struggling with these symptoms.